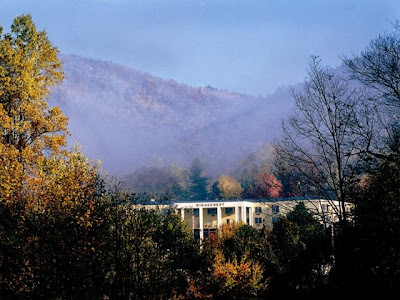 Greetings from Ridgecrest, a retreat center located in the Blue Ridge of western North Carolina. Over the next few days, we will be seeing a gathering of bishops, clergy, and lay leaders from all across the United States and Canada as they come together for the Provincial Assembly of the Anglican Church of North America. Kevin Kallsen and George Conger will also be here along with a host of old friends and new friends from all walks of life. , Archbishop Duncan, John Guernsey, Sam Thomsen, Keith Ackerman, David Anderson, Julian Dobbs, David Roseberry, Martyn Minns and Neil Lebhar who just arrived off a plane from Israel. It is interesting to have a legislative gathering in a retreat center. The environment here is so focused on prayer and hospitality and with the mountains and simple life here it is quite a contrast from all those Episcopal General Conventions. Serious business will be done, but at the same time there seems to be a lot of effort underway that this would be not only a time of governance but a time of renewal to do the work God calls us to do. I will be sharing pictures and videos and observations while I am here. Please do pray for all those who are coming, for safe travel and for wisdom and discernment and that it would be a time to build new friendships, renew old ones, and prayerfully seek the Lord first, in fact, let's play that one now and thank you so much for your prayers! I am looking forward to this Assembly in NC. I remember the 100+ temps in Bedford TX at the first Assembly --not my cuppa tea. And I attended 6 general conventions -- they progressively down hill. My last was Columbus OH in 2006. I vowed I'd never attend another and I haven't. Hope to see you. It is no where near 100+ here - I do remember those temps though in Bedford! Very glad you are going to be here, David. Prayer for wisdom, love, peace and rest for all involved. Mary, looking forward to the updates! I'm praying from here in Africa. Please greet friends like +Martyn and +John G. for me!